Wrightway-Madison is proud to offer the #1 gutter protection system on the market, Gutter Helmet®. Whether you are constructing a new home and want to make sure you won’t have to perform the tedious task of cleaning your gutters season after season or you are looking for a permanent solution to keeping the debris out that accumulates in your existing gutters, Gutter Helmet is the solution. Our installers will ensure that your installation is done in a timely manner, and we will never leave a mess behind for you to clean up. 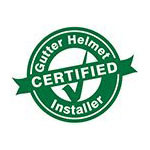 Our mission is to exceed expectations with our Gutter Helmet and home improvement customers by providing superior products and excellent service. We possess all of the qualities of a contractor that you can trust and provide our customers with a clear written document of your home improvement solution. Get a free quote from Wrightway-Madison on our home improvement services by calling us today. Our expert customer service team would be happy to provide information about our Gutter Helmet® systems or any other home improvement products we offer. Alternatively, fill out our convenient online form.